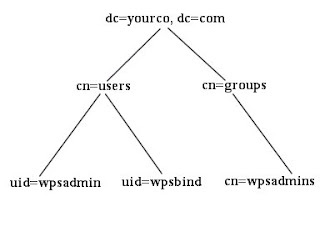 copy the portalusers.ldif file , and change the dc=yourcompany,dc=com with your sepecific details. Portal administrator DN ="uid=wpsadmin,cn=users, dc=yourco,dc=com"
Portal administrator group ="cn=wpsadmins,cn=groups, dc=yourco,dc=com"
a) make sure above properties proper (like LDAP admin ID(bindDN), PWD). Once the above commands executed successfully, restart the portal and application server if its already started. Great article!!. If I have configured a federated LDAP (IDS), do I need to remove it first, to add as a stand alone? or, Is it possible to run ConfigEngine.bat wp-modify-ldap-security and it replaces for IDS standalone? Thanks.